Therefore, when connect it with a coupler; it screws in thoroughly without the necessity to make a thread on the bar. Its rib is developed by arranging to a special coarse thread pattern. The transversal rib of ONE-Bar is rearranged to the coarse thread pattern. It can excellently resist either tension or compression. 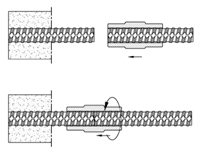 Moreover, this type of thread profile allows us to screw in and out quickly. ONE-Bar use proper chemical composition that suit for welding. It is then flexible for various kinds of works. (TIS 24/2548) as the same as the conventional deformed bar. ONE-Couple is compatible with ONE-Bar and conforming to various standards, i.e. E.I.A.T., ACI318, BS8110, DIN1045, etc. The strength of mechanical joint is designed superior to the bar itself. Under tensile test in laboratory, bar breaks outside joint. Thus, ONE-Bar becomes the real Full Tension Splice that no competitor can be equivalent. Transversal ribs are in left-hand turn pattern throughout the entire length of ONE-Bar. Wherever it is cut, a ONE-Coupler can screw in easily. Type A: The connecting bar is rotatable (general case). Type B: The connecting bar is slightly rotatable. 1) Mark the fixed end of ONE-Bar at a distance ½ of coupler. 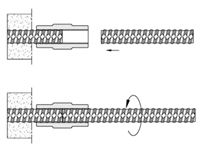 2) Screw in the coupler with the connecting end of ONE-Bar so that it is fully engaged in the coupler. 3) Bring the connecting bar with the coupler to the fixed end of ONE-Bar. 4) Screw in the coupler to the fixed end of ONE-Bar until reaching the mark. 5) Tighten the system by turning the connecting bar. Type C: The connecting bar is not rotatable. Follow Type B (step 1-4) but use a lock nut with the coupler. 5) Tighten the system by turning the Lock Nut. 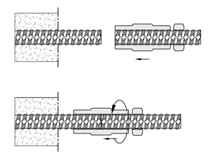 1) ONE-Bar can be cut and connect immediately without additional threading. 2) There is neither scrap nor wastage from threading. 3) Surface hardness is remained the same at all time (because of no threading). joint that exists with other system. 5) Cross section area of bar remains constant. and connect it any time they need to. 7) There is no hidden cost, e.g. crane service, labor camp, electricity, working area, etc. 8) Decrease congestion in job site so that it is easier to control and security. 9) Increase safety in job site, no risk for electricity accident, fire, smoke, and smell from welding. 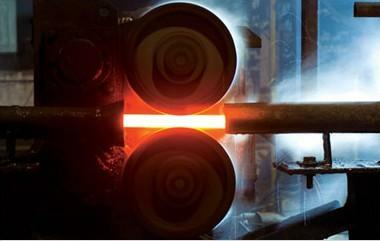 10) ONE-Bar is weldable and can be connected to other steel structure whenever required. 11) ONE-Bar can be cut before or after fixing. 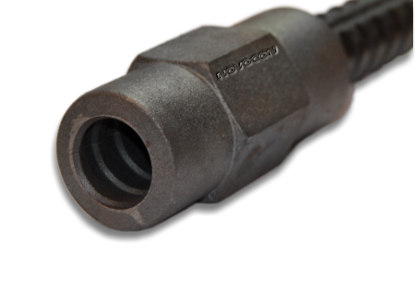 12) The hexagonal shape of coupler helps easy wrenching without torque wrench. 13) Decrease construction time because of the readiness for connection. 14) Reduce the overall cost of construction efficiently. 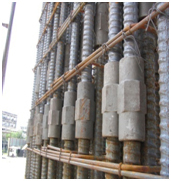 - Can be used as conventional deformed bar for reinforcing concrete. - Horizontal bars in mat foundation, concrete slap and wall. 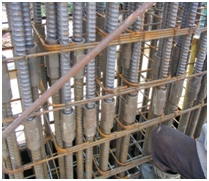 - Anchor bolts, hold-down bolts in pier and foundation. 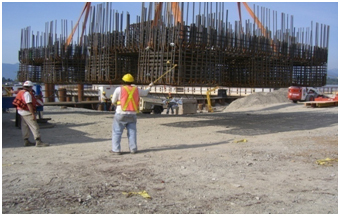 - Vertical bars in pile, pier, column, wall, and shaft. - Starter bars in core wall, diaphragm wall, shaft, and opening in slab. 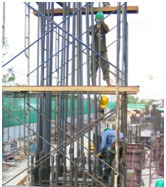 - Construction joints at concrete slab, wall and shear wall. - Anchor bars, shear bars at high punching shear zone. - Lifting studs for pre-cast concrete. 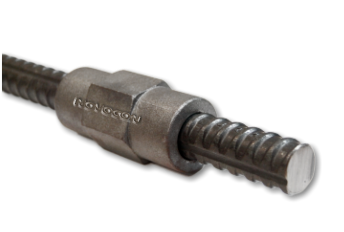 - Rock bolts, Soil nails for mining and slope protection. - Any other applications that require high reliability.